It’s late September and Fall is here! What a great time of year; football, cool mornings and warm afternoons, and planting season. It is a great time to plan for your Fall/Winter landscape additions or enhancements. In my professional opinion, the best time for the installation of new plant material is late Fall and Winter for the larger materials and then early Spring for the small plants such as the perennials and small shrubs or ground covers. This separate planting schedule helps to prevent losing plants to the cold blasts Atlanta and North Georgia can get during the Winter. The larger plants are self-insulating and generally make it through these cold snaps. However, the smaller plants’ rootballs freeze solid, bursting the root hairs and destroying the capability of the roots to function properly upon thawing. The plant dies! This is not due to poor quality plants or contractor error: just plain and simply they “froze to death”. So, phase your installation times if possible and I’m sure you will have more success with the survivability of your new landscape. Now is a great time for planning your new landscapes. Pollock & Associates, Inc. can provide you or your friends with a comprehensive master plan that will allow you to phase the implementation over this Fall, coming Spring, as well as future years as necessary. We offer a free initial consultation, so call today to set up an appointment. We look forward to meeting with you! It’s the second week of September. The summer heat is all but over. Now is the time to re-seed your Fescue lawn. September 15th is typically the date to begin your re-seeding in Atlanta and North Georgia. Now is the “prime” time to re-seed. Fall is the best time for this, and getting a jump on it now helps allow the new seeds establish a stronger root system before the winter begins. There are a few things to consider, however, before you apply new seed. First—make sure you purchase fresh new seed harvested this year. Check the label and date and get the lowest percentage of weed seeds as possible also. Second—the soil must be prepared to receive the seed and promote germination. If you just throw seed on top of the ground, you will probably just be feeding the birds! You need to aerate the soil thoroughly. 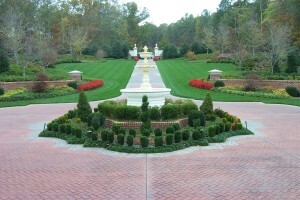 You can rent an aerator or hire a landscape contractor to do this for you. Third—apply the seed evenly with a proper spreader. Follow the directions on the bag for the setting for your spreader. Fourth—make sure to add a balanced fertilizer and lime at the time you re-seed. A balanced fertilizer would be 10-10-10 or 13-13-13. Fifth—water thoroughly/regularly, and sit back and watch it grow. I do not recommend you apply wheat straw. Wheat straw has a lot of weed seeds in it and they will germinate with your Fescue seed, and then you wind up with weeds in your new lawn. Fescue likes cooler nights and mornings with warm sun in the afternoon. By mid-September this is usually the situation in Atlanta. Summer is almost over. The record heat of this summer in Atlanta and Georgia, is starting to back down a little. Believe it or not, Fall is just around the corner. Cooler daytime high temperatures are coming soon as are the refreshing cooler mornings. This is very important if you are wanting to re-sod your lawn. Do it now!!!! By September 15th, warm season lawns, (Bermuda and Zoysia), start to go dormant in the Atlanta area and north Georgia. These grasses love the hot weather and the longer daylight hours. It is best to install new Bermuda/Zoysia sod in the summer months to allow a period of time for the new grass to root in/acclimate before the Winter arrives. This helps prevent Winter damage/death to the new lawn. You can install Bermuda/Zoysia even in the Winter months while it is dormant, you just add a higher risk factor to the survivability of your new lawn. Many times, however, schedules are such that we don’t have a choice. In these situations, just know there is a gamble involved and don’t get too upset if you loose some of the new sod. The contractor may have provided you with healthy grass and installed it correctly; Winter may still take it out. So—you can’t always blame the contractor, or expect it to be replaced under warranty. Frequently, new sod is harvested in the Winter at a farm in south Georgia or south Alabama, and then brought to the Atlanta area and installed. It was growing in a milder climate, dug up and trucked to Atlanta, and layed on top of the ground of a landscape project. Then rudely, the very next night, it is having to endure sub-freezing temperatures because a cold front blew through. OUCH! This can cause damage to your new grass. The roots can freeze solid because of the moisture in them, burst, and then become non-functional. If these roots don’t function, the leaves of the grass won’t stay alive. The new sod will die. This may not be completely visible until Spring when you expect to see your lawn greening up. In summary—-try to install your new sod now, or wait if you can until next late Spring. If the construction schedule does not permit this, be more understanding and knowledgeable of what you are attempting to do. This should help you be happier with your new landscape. Knowledge is a good thing. We may not like the outcome, but if we understand why it happened we are more content. As always, I hope this is informative and helps you with your landscape. If you would like a FREE consultation about your landscape, call us at ——-Pollock & Associates, Inc.———770-569-5900. Pollock & Associates, Inc. has 29 years of experience working with Home-builders and Residential Developers in the Atlanta area and throughout Georgia. We started the company working with new home builders. Frequently we provide our Builder clients with a Landscape Package for individual homes or the entire subdivision, (a plan for each lot). This design service can prove to be very valuable in creating that professional, finished look enticing the potential home buyer to get out of their automobile and into that front door. Our plans are very carefully thought out to maximize each individual lot’s assets and to help conceal any negatives that may exist. Each plan will emphasize and compliment the architecture of the home. Budgets for Builders are crucial. Each plan is designed to meet, (not exceed), the established budget. The challenge for Pollock & Associates, Inc. is to make the proposed landscape look enticing to he potential buyer, maximize the Builder’s budget, and compliment the architecture of the home without creating a high maintenance situation in the years to come. Often, basic plant materials are used in landscapes for new homes because you can get a bigger plant in a 3 gallon container for more immediate impact. However, a 3 gallon Cleyera under a 3′ high window may look good today, but is an absolute nightmare of a maintenance problem in a few years. A Cleyera wants to be 12′ high and 10′ wide, hence this is not the plant for this location. We recommend plants that will create the immediate impact desired but also will be long lasting and lower maintenance for the Owner. This is also better for you Home-builders because your product looks better in the future years to come and is not an overgrown mess. The Builder winds up with a better looking product and a better reputation. Another interesting feature offered by having a Landscape Plan for each lot in a subdivision is that ultimately a “Streetscape Plan” is achieved, one lot at a time. By designing each lot, we can mesh the plans together to create a flowing streetscape that is consistent from house to house throughout the entire project. This is a very underrated element in most projects in the Atlanta area. The consistency created by this planning process is very noticeable and the project has a cleaner, crisper, more professional appearance that most home buyers desire. Lastly—most Builders are not completely knowledgeable about what they are getting for the dollars they spend on their landscapes. Often it is whatever the landscaper supplies for the budget is what the Builder gets. Our plans eliminate this unknown. By specifying/detailing the plant materials the landscaper is held accountable for their charges and the Builder gets the most for his budget. I hope this is informative to you and if there is interest in this service, please call us at, Pollock & Associates, Inc. 770-569-5900. As many of you plan your Outdoor Living Area, a Fireplace or Fire Pit might be included. Here are a few ideas to consider when deciding which one to have. Both are very functional and enjoyable. There are, however, some real differences. First—A Fireplace is usually found in a more formal Outdoor Room situation. Because a Fireplace is typically one-sided, you are usually sitting facing it. This can be a bit restrictive when placing the Fireplace or even the furniture. We at Pollock & Associates, Inc. frequently include an Arbor/Pergola above the designated sitting area when the Fireplace is outside and not in a roofed/covered area. A Fire Pit is more casual and can have people sitting on all sides of it. A Fire Pit can also have an Arbor/Pergola associated with it if desired. Second—Fireplaces will normally cost more and be more difficult to construct, and Fire Pits will be less and easier to construct. Third—A Fireplace can be used to help screen an unwanted view and can also house other features such as TV’s and music systems. Fire Pits are usually found in the center of the sitting area and become the focal point. Fourth—Both a Fireplace or Fire Pit can be used with real wood or gas logs or just a gas starter. Fifth—A Fireplace will typically also require more patio space associated with it than a Fire Pit. This too will have an additional cost. Fireplaces and Fire Pits are very nice features to include in your Outdoor Living Area. In Atlanta, they can be used year round. They both create a comfortable gathering space for your friends and family. If you need a Fire Pit or Fireplace built we recommend you contact Specialty Construction Group, Inc. They have extensive construction knowledge and experience in outdoor living areas. You can contact them at www.specialtyconstructiongroup.com or email Dan at dan@specialtyconstructiongroup.com. For more information and a FREE CONSULTATION about your own Fireplace or Fire Pit, call——-Pollock & Associates, Inc.—–770-569-5900. As an Atlanta Landscape Architect with (35) years of experience, I have been involved in many Residential Pool and Outdoor Living Area designs in the Atlanta Metro Area and across Georgia. Frequently it has been a “mad dash to the finish” to complete the construction and have the pool, etc. ready by May. A lot of the time this is very difficult on all involved, unnecessarily. The stress imposed on the Client, Landscape Architect, the Pool Builder, and other subcontractors can be avoided. How?————– Simply start the process earlier! Now is the perfect time to start your project. It takes quality time to design a Custom Pool and Outdoor Living Area. If you start your project now, it can go a lot smoother with, a lot less stress. Most pools with other amenities such as; an Outdoor Kitchen, Fireplace or Fire Pit, Decks, Arbors, Water Features, etc. can take (1-3) months to plan/design thoroughly. The Bidding and Permitting process can take up to a month. The construction time for such a facility can take (3-4) months, especially during the Winter months. So—added up, we are now at (5-8) months, start to finish. If you start early, (now), you allow a cushion of time to work out any unforseen situations to insure your pool is ready to enjoy for the entire next season. Pollock & Associates, Inc. has designed numerous Residential and Commercial Pool Facilities across Georgia. We are extremely creative in designing Swimming Pools and Outdoor Living Areas specifically designed for your site. We listen to our Client’s likes and dislikes, and we are very keen to design to a budget. Most all projects have construction budgets. I have only had (3) projects in (35) years that I was told to not worry about how much it costs. Therefore, constuction budgets are important. As the price of our water goes up in the Atlanta Metro Area, we all try to find ways to reduce our usage and the bill. One way some people do this is by tapping their irrigation system into a nearby lake, stream, or into a well. Ultimately this will reduce the water bill but there is more to this topic than what you might think. The obvious– saving money through lower water bills. You can water as often as you like during dry periods. The natural water is typically healthier for the Atlanta lawns/landscapes. You will have a more lush looking lawn and landscape. The initial installation costs are higher because of the pump materials, well-drilling costs, and the additional labor required. The organics in the water can clog the filter at the pump or the nozzles in the heads resulting in more maintenance for the irrigation system. Frequently, weed seeds are spread through the system as they are present in the natural water sources and get sucked into the pump and out through the heads onto the landscape. The result—more weeds. This can require more landscape maintenance and chemicals to control the weeds. This third disadvantage is one many Atlanta Area people are unaware of and find out about the hard way. Generally, this is controllable by a reputable Landscape Maintenance Company. When deciding whether or not to install a pump and use lake, well, or stream water; do some math first. What does your city/county water cost per gallon? What would it cost to install a subtraction meter behind your main meter to measure the water going to the irrigation system? (This water can be subtracted from your overall usage so you won’t have to pay the sewage fee on the irrigation water.) Then, get a price from a competent Irrigation Company to install a pump, drill a well, etc. to use non-city/county water. A pump alone can cost $1500-$2500 installed; wells are a lot more. Next, you will need to determine how many gallons of water your system uses during a full cycle and how many times you typically run the system per week/month. Now, you can start to compare the operational cost differences. The next big item is; how long are you going to be in this house? How long will it take to recoup your higher installation costs through usage savings? Will you be in this house long enough to reap any savings? If you are going to live in this house for many years, it is usually a good idea to check into using non-city/county water for irrigation. These are all-important ideas to think about before installing a pump or well system. Summer is here and in full swing. Hot, humid days make for the perfect breeding environment for the fungi that attack Fescue lawns (as well as Bermuda and Zoysia) here in Atlanta. Very frequently our lawns in Georgia are over-watered because we think the “browning” we see is from a lack of water. To the contrary, it is most often a fungus. By applying more water we are actually creating a better environment for the fungus and not helping the grass at all. Last summer many Fescue lawns almost died out completely due to fungus infestation and over-watering. The more brown we saw in the lawn, the more water we applied. It was hot last year and rained a lot also. This was the “perfect storm” for the Fescue demise. So – don’t water so much. Apply fungicide regularly to prevent fungi growth. Contact a reputable Atlanta lawn chemical maintenance company and get on a professional maintenance prevention program. It is money well spent. You may even save money in the long run by not watering so much, and your lawn will love you for it. Fescue is a viable lawn for Atlanta gardens and turf areas. Through proper chemical applications a healthy, vigorous Fescue lawn can be obtained. For more information on this topic contact one of the professionals in the turf maintenance business or call me, Jim Pollock, at Pollock & Associates, Inc. — 770-569-5900.